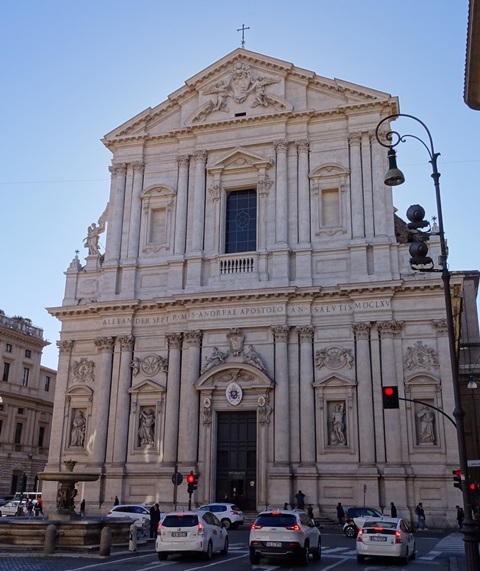 The Sant’Andrea della Valle is a huge church in the rione Sant’Eustachio, not far from the Campo de’ Fiori and the Piazza Navona. It was built at the site of a much older church (the San Sebastiano in Via Papae) and a palazzo that was the property of the influential Sienese Piccolomini family. Construction of the Sant’Andrea started in 1591 and the church was not consecrated until 1650. Several architects have worked on the church throughout the years, among them Carlo Maderno (1556-1629) and Carlo Rainaldi (1611-1691). Maderno’s plans were executed after 1608, and they included the construction of a huge dome between 1620 and 1622. 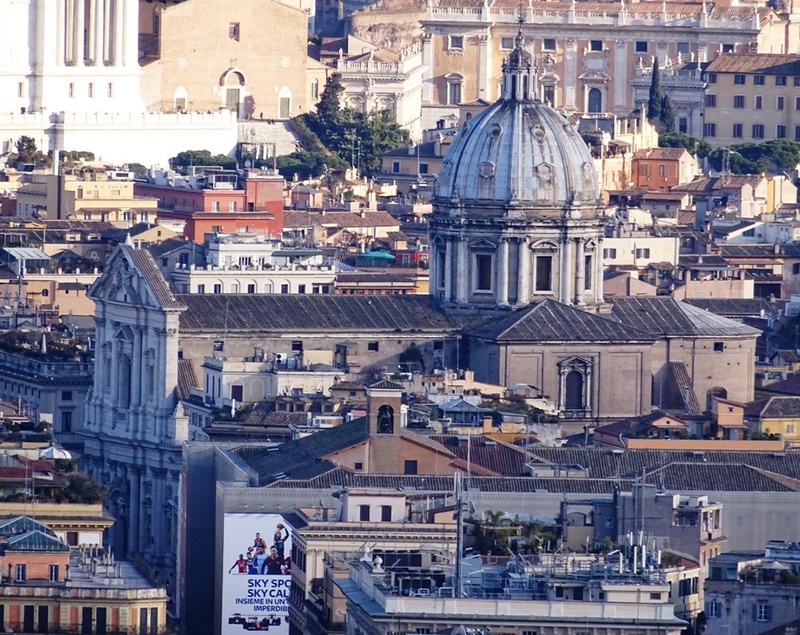 It is the third highest dome in Rome, after that of Saint Peter’s Basilica (of course) and that of the twentieth century Santi Pietro e Paolo church in the EUR district. Alexander was born Fabio Chigi, and like the Piccolominis, the Chigis were from Siena. The church is of course dedicated to Saint Andrew the Apostle (Andreas; Andrea in Italian), who was Saint Peter’s brother. 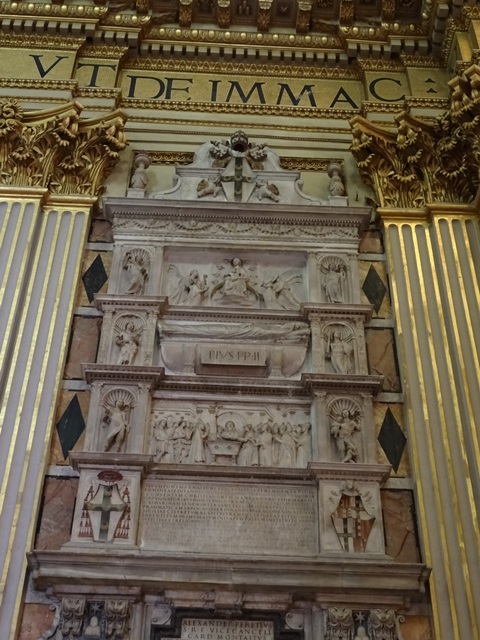 His statue – the work of Ercole Ferrata (1610-1686) – can be seen in the niche to the left of the main entrance. Above the statue is a tondo held by two putti, in which an X-shaped cross is chiselled. This refers to the tradition that Saint Andrew was crucified on such an oddly shaped cross. The saint in the niche on the other side of the entrance is Saint Sebastian, obviously a reference to the San Sebastiano church that was demolished to make room for the Sant’Andrea. He can be identified by the bundle of arrows in the tondo above his niche. The church’s gigantic dome has a diameter of 16,1 metres. It is 80 metres high and best admired from a distance, for instance from the Gianicolo hill on the other side of the Tiber or from the cuppola of Saint Peter’s Basilica. The dome was frescoed on the inside by Giovanni Lanfranco (1582-1647). The artist painted his Assumption of the Virgin in the 1620s. Sant’Andrea’s apse wall was decorated by Mattia Preti (1613-1699), the Knight Hospitaller from Calabria. I previously wrote about his work in a post about the Galleria Corsini. The wall is covered with three large rectangular paintings. The one on the left shows Saint Andrew’s martyrdom on the X-shaped cross, the one in the middle is about his death on the same cross, while the third and final one deals with his burial after his descent from the cross. Paintings on the apse wall by Mattia Preti. The tombs of Popes Pius II and Pius III can be found in this church. The former was born Enea Silvio Bartolomeo Piccolomini (1405-1464), while the latter – who was the former’s nephew – was named Francesco Todeschini Piccolomini (1439-1503). Naturally, these tombs were not originally part of the church, as both popes died well before construction of the Sant’Andrea even started. The tombs were originally in Old Saint Peter’s Basilica and were moved here in 1614 on the orders of Pope Paulus V (1605-1621). This move is quite appropriate, as both popes were members of the Sienese Piccolomini family whose palazzo had been demolished to make way for the new church. This palazzo had in fact been commissioned by Enea Piccolomini, so in a way he was back home again (the monuments are cenotaphs, but both popes are buried in the church). Pope Pius III’s pontificate was one of the shortest in history. It lasted just 26 days in 1503, so his elaborate four-storey tomb seems a little disproportionate (although he did build one of the most beautiful libraries in all of Italy). 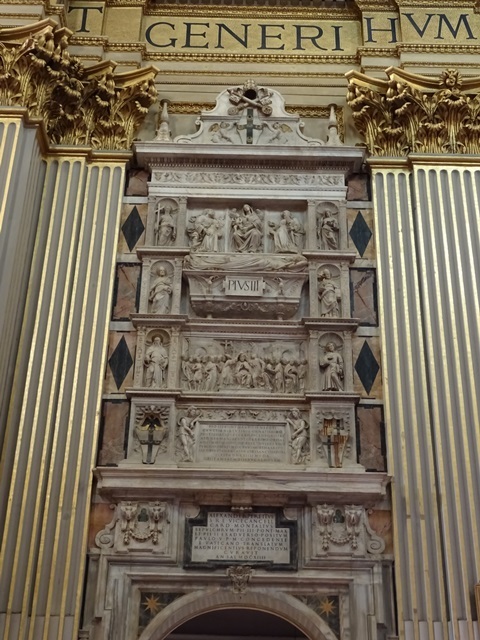 Pius II’s tomb (ca. 1470) also has four storeys and was probably the inspiration for Pius III’s monument. The tombs are perhaps somewhat difficult to find: you have to look up, as they are above the side exits. The church seen from Saint Peter’s Basilica. 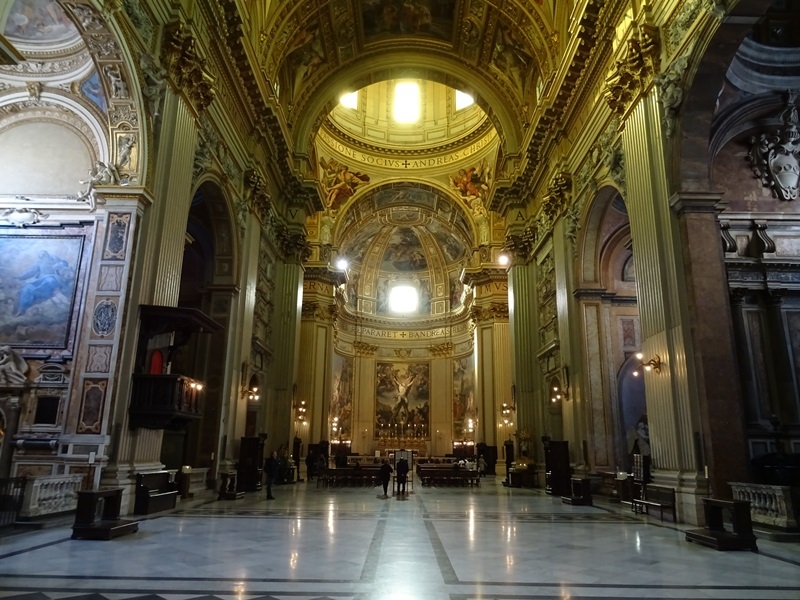 Sant’Andrea della Valle on Churches of Rome Wiki.